It's been five years since the last Nasa rover blasted off to Mars. 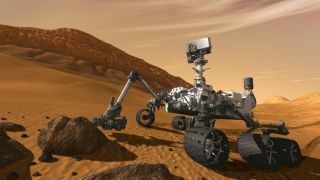 Curiosity went to the Red Planet equipped with tools and instruments that were cutting edge, but five years is a long time in technology. It's now possible to cram a lot more into less space. So Nasa is working on a new mission, named Mars 2020, that will feature a rover. Superficially, it resembles its predecessor – it has six wheels, a long arm for examining objects and a mast camera peering out over the landscape. In fact, about 85% of the robot is the same. "The fact that so much of the hardware has already been designed – or even already exists – is a major advantage for this mission," said Jim Watzin, director of Nasa's Mars Exploration Program. "It saves us money, time and most of all, reduces risk." But there are a few crucial differences. The new robot has seven new instruments, totally redesigned wheels and much more autonomy than its forebear. It'll be capable of drilling out rock cores, sealing them into little capsules and then dropping them on the surface for collection by a future mission. The rover also has a rather different mission: it's going to be looking for signs of ancient life. An x-ray spectrometer will be able to examine rocks as small as a grain of salt, while a ground-penetrating radar will hunt for water and ice below the surface. It even has an ultraviolet laser capable of spotting rings of carbon atoms. A second laser will be able to vaporise rocks and soil, while its camera hardware has also been substantially upgraded. What hasn't yet been decided is exactly where it'll land. There are three potential sites - recently narrowed down from a longlist of eight. One is an ancient lakebed, another is a possible hot springs, and a third is where warm waters may once have sloshed up against surface rocks. The final decision will be made in a year or two.